This news has gone largely unnoticed in the world of the web and e-commerce. While everyone else was (is) still busy with GDPR, Google announced a major change in the use of the Google Maps API, one of the most frequently used APIs worldwide and vastly popular with e-sellers. Launched in 2005, Google Maps, Google's online mapping service, has become popular with millions of websites who use the service to geolocate their physical store or for booking sites. The service soon overtook the competition (ViaMichelin, Mappy, Bing Maps, ...), as well as tools based on the Open Street Map project such as WeMap or Mapbox. Users have become accustomed to not paying for Google's services up to a certain usage limit, with only the largest users of Google Maps having to foot the bill. But this will all change on July 16, 2018. What are the new usage charges for the Google Maps API? Let's use Google Static Maps API as an example. Currently, a company is allowed 25,000 free map views per day. 1,000 additional API views are charged at $0.50. A fairly reasonable price that currently only impacts a few users. On July 16, for the same map, this limit will change to 28,000 maps views... per month. Google will then charge per pack of 1,000 views ($7 instead of 50 cents). Companies who exceed these quotas will have to pay quite a price for a service that was until now freely available. Users who remain below quotas will still have to add their credit card details (using a key to access the API) if they want to continue using Google Maps. If the user does not provide their details, their page will display an error message instead of the map. 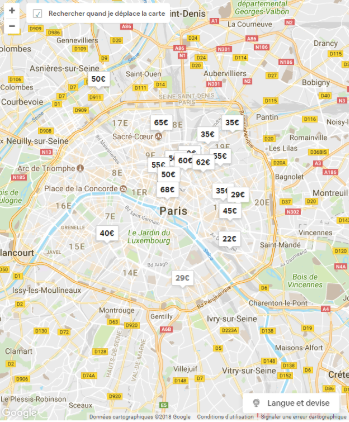 "A site that displays 10,000 maps per day therefore goes from paying $0 to $1,764 a month, and those who were close to the free limit of 25,000 maps/day will now be charged $ 4,704 a month," explains Christian Quest, spokesperson for OpenStreetMap France. Google has also announced it will offer $200 worth of credits every month. Are all Google Map APIs affected? The use of Google Maps in mobile native apps will be unlimited and free. This will also be the case for "embed" use on a website, that is to say the simple display of maps. Google has published the details of its new pricing structure. In contrast, Place / Directions / View services will now be chargeable. Firstly, you can already opt for "Embed" maps that will allow you free and unlimited use. You can also find all the modules dedicated to Google Maps at our Marketplace. For example, you can opt for the Google Map Store Locator module. Will the Google Maps mobile app and its web version start charging users? Rumors were circulating that the service would also start charging users, but this is untrue, access will remain 100% free for users (thankfully). We will soon be sending you precise solutions according to your usage of Google Maps.